Native to Europe, bulbous buttercup is one of the common names of Ranunculus bulbosus that is a perennial member of the Buttercup Family. 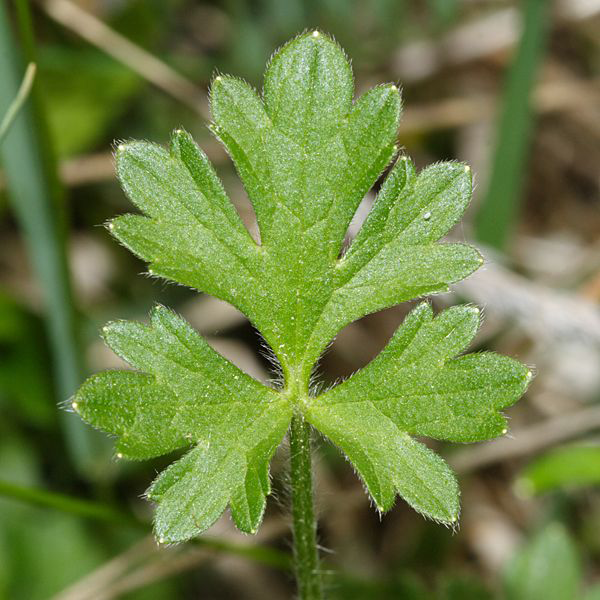 Other common names of this herb includes Crowfoot, Cuckoo Buds, Frogsfoot, Frogwort, Goldcup, Hierba Velluda, King’s Cup, Meadowbloom, Pied-de-Coq, Pied-de-Corbin, Pilewort, Rave de Saint-Antoine, Renoncule Bulbeuse, St. Anthony’s Turnip, Blister flower, Bulbous crowfoot, Gowan and Yellow weed. The plant has attractive yellow flowers, and deeply divided, three-lobed long-petioled basal leaves. Bulbous buttercup is known to form tufts. The specific name bulbosus refers to the bulb-like swelling at the base of the stem, roundish and white, flattened a little both at the top and bottom, somewhat resembling a small turnip – hence one of the popular names for this plant: St. Anthony’s Turnip. It is however, not a true bulb, only ‘bulb-like.’ The common name “blister plant” comes from the blistering that occurs in the mouth and intestinal tract when cattle eat the plant. 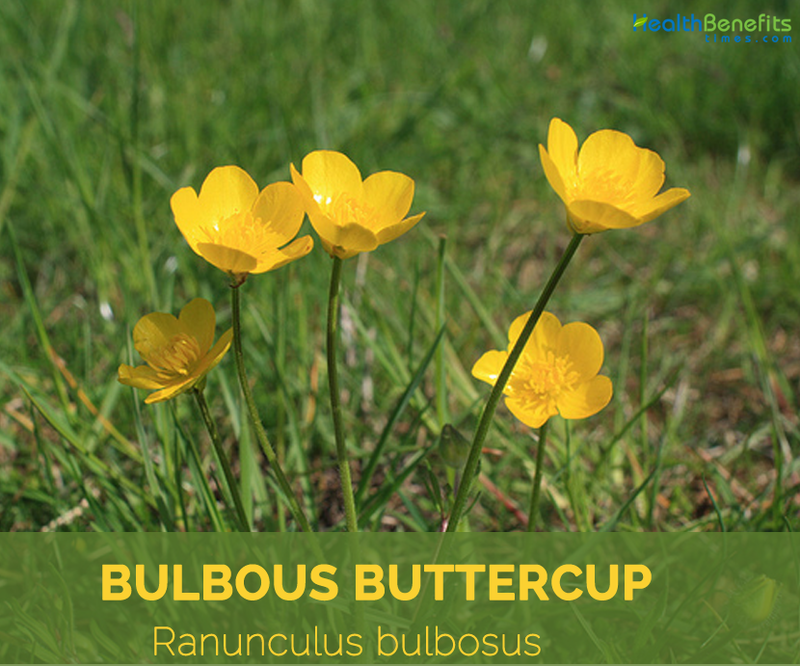 Bulbous Buttercup is a low-growing perennial herb that grows about 1 – 2 ft. (30 – 60 cm.) tall. 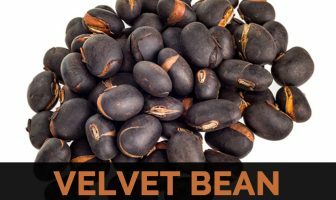 The plant is found growing in dry meadows, meadows, grassy rocky outcrops, banks, yards, lawns, dry pastures, grassy slopes, fixed dunes, casually in harbors and normally prefers nutrient-poor, well-drained calcareous soils. The plant has a tuber on the underground part of the stem. The plant has erect, long-branched stem, with tuber at base, lower part hairy, upper part mostly leafless. Bulbous buttercup gets its name from its distinctive perennating organ, a bulb-like swollen underground stem or corm, which is located just below the soil surface. After the plant dies in heat of summer, the corm survives underground through the winter. 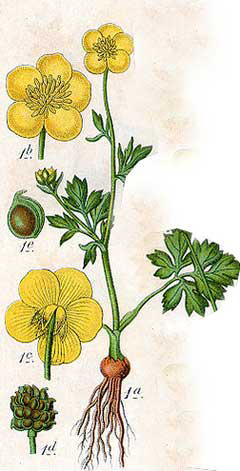 Although the presence of a corm differentiates Ranunculus bulbosus from some other species of buttercup such as Ranunculus acris, the species also has distinctive reflexed sepals. Basal leaves occur on long petioles and are divided into 3 lobes. 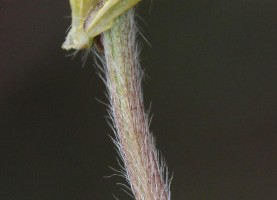 As the leaves become more mature, the central lobe occurs on it’s own stalk while the lateral lobes are attached directly to the main leaf petiole. 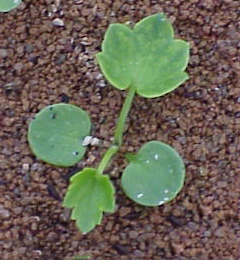 Stem leaves are generally smaller than the basal leaves and arranged alternately along the stem. Stem leaves are also less distinctively lobed than the basal leaves. 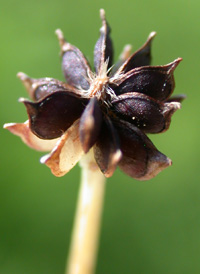 Single flowers occur on flower stalks at the ends of stems. Flower is golden bright yellow, shiny usually 1 in. (2.5 cm.) wide. Flower consists of 5 sepals hanging down and 5 petals on grooved stems. Petals are longer than sepals. Flowers consist of numerous stamens and ovaries. Flowering normally takes place from April to July. 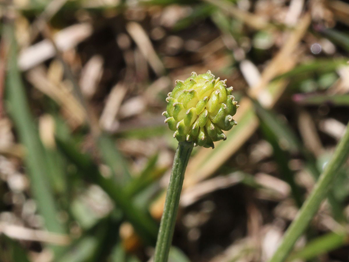 Flower is replaced by elliptic, glabrous achene, edges winged, and tip with short, much curved bristle. Ranunculus bulbosus is quite beneficial for joints, mainly those distressed with gout and rheumatism. When applied directly to the skin, the plant help to ease the symptoms and pain associated with stiffness and joint pain. Fibromyalgia, previously known as fibrositis, can also be cured using ranunculus bulbosus. This condition is marked by muscle spasms, pain, stiffness and tender areas in the neck, shoulders, hips and spine. Ranunculus bulbosus works mainly on easing the stiffness and pain. 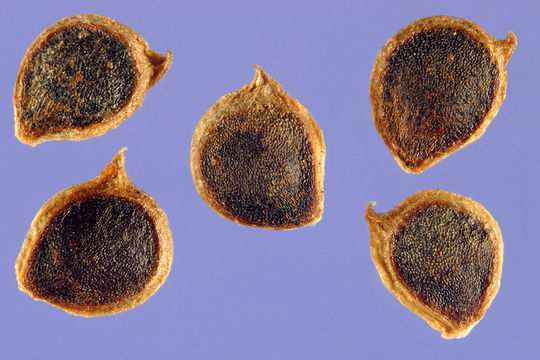 Bulbous Buttercup is quite helpful in alleviating shingles, which are also known as herpes zoster. 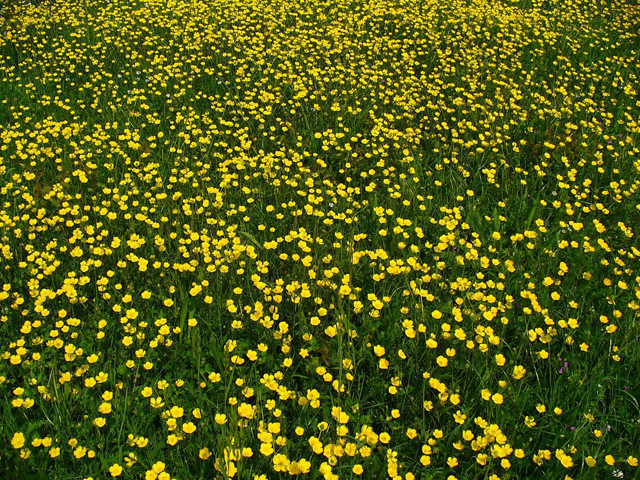 Bulbous Buttercup works especially well for shingles that are mainly itchy and sore, and on the back or front near the ribcage. Ranunculus bulbosus tincture can help lessen the pain and itchiness, as well as reduce the outbreak of blisters and pimples. The herb can also provide relief from headaches. If you place a small dab of the plant’s juice into your nose, it can encourage sneezing. This sneezing can alleviate some headaches. 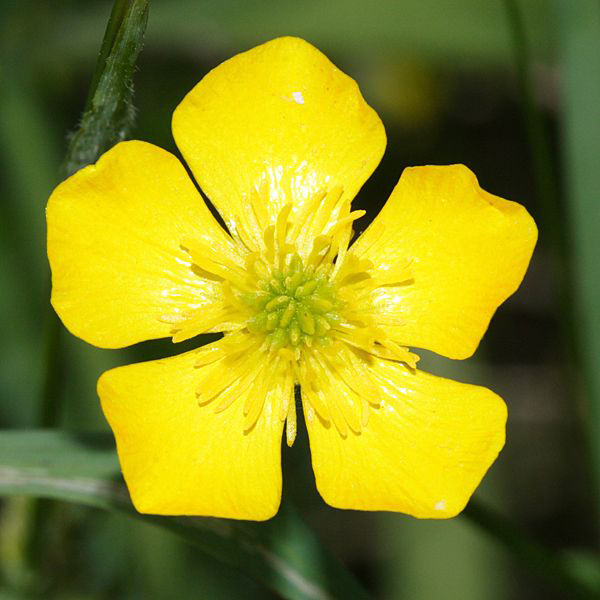 Bulbous Buttercup can relieve a sore and painful mouth. Tender, uncomfortable and aching oral symptoms can benefit from a ranunculus bulbosus infusion made with boiled water and then cooled before drinking. You can also rinse with the ranunculus bulbosus infusion to further help healing. Ranunculus bulbosus has a couple of other beneficial uses. The painful nerve condition of sciatica can also be cured using ranunculus bulbosus when used as a tincture. 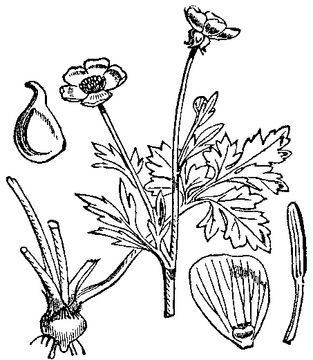 Boiled ranunculus bulbosus roots make a food for livestock that doubles as a stimulant. Pigs enjoy the boiled roots with no additives, whereas cattle prefer them mixed with other greens. Juice, if applied to the nostrils, provokes sneezing and cures certain cases of headache. Leaves have been used to produce blisters on the wrists in rheumatism, and when infused in boiling water, as a poultice, at the pit of the stomach. The herb was recommended by herbalists for resolving dermatologic, rheumatologic, gastrointestinal, and dental complaints. Plant was stuffed into dental cavities and its infusions were rubbed on the gums of teething infants. It is also useful for curing corns occurring on the soles of feet, wherein they become very sensitive when touched and are complemented by a burning and bothering pain. This homeopathic remedy is an effective cure for persistent sciatica, professional neurosis and writer’s cramp. This homeopathic remedy is indicated for treating various types of chest disorders, particularly intercostal rheumatism, wherein the intercostal muscles are afflicted by some type of rheumatism, myalgia, neuralgia and sometimes also the pleura is afflicted. It is also useful for chest problems attributable to coming in contact with cold as well as physical hard work. It is also beneficial for women who experience pain in the periphery of their shoulder muscles owing to needle work or playing piano or type writing. It is considered to be the most effective homeopathic remedy for treating shingles, particularly when shingles occur on the body’s trunk. Homeopathic remedy recommends it for treating severe cases of burns and itchiness that worsens when the skin is touched, when there is motion or while eating. It is also best homeopathic remedies for treating the adverse effects of consuming excessive alcohol, delirium tremens and spasmodic hiccoughs. It is ideal for curing stitching pains inside the ears, particularly during the night, and which deteriorate during the evenings. It has also been effectively used to cure several conditions related to the face, including vesicular flare-ups on the face accompanied by an intense burning sensation; itchiness of the nose, face and chin, epithelioma of the face as well as twitching or trembling of the lips. It is also effective for treating throat aches complemented by burning sensation and inflammation as well as the smarting and tingling in the soft palate. It is an excellent homeopathic remedy for rheumatic conditions, especially when the condition also involves the chest muscles. The herb is also very effective for treating pleural effusion, particularly when the ribs are very painful – mainly the ribs in the lower portion. Whole plant especially the sap, is acrid, anodyne, antispasmodic, diaphoretic, rubefacient. Root has been placed in a tooth cavity to act as a painkiller. Decoction of the plant has been used in the treatment of VD. Homeopathic remedy Ran. B. is useful for treating chronic cases of costal rheumatism. It is also used for treating the tenderness of the diaphragm attachments, in addition to pleura and inflamed diaphragm. It is effective for curing hydrothorax pains inside the chest caused by pleura sticking together. The herb is also effective for curing any type of pain in the area surrounding the heart that may occur owing to motion plus inspiration, in addition to lying on one’s left side. It is also useful for conditions like pectoral muscles’ rheumatic distension accompanied by intense pain, especially when someone touches the area. It is considered to be a vital medication for treating rheumatic afflictions of the abdominal muscles as well as those at the back. This homeopathic remedy is beneficial for people who experience great thirst during the afternoons. This remedy is useful for conditions suffered by women, especially for curing excoriating leucorrhea as well as intense pains in the ovary that deteriorate when the weather condition changes from warm to cold, due to motion and also during the evening. This homeopathic remedy is showed for treating vesicles or formation of small blisters on the skin, pemphigus and bullae. It is generally used for treating several kinds of skin afflictions, including burn injuries, vesicular eruptions, eczema, herpes zoster and even pemphigus. There is no proven safe or effective dose for bulbous buttercup. Tea made from fresh leaves has been used for gastrointestinal upset, and decoctions of bulbous buttercup have been used to treat sexually transmitted diseases. Tinctures taken by mouth have also been used for sciatica and shingles. Fresh root put in the tooth cavity has been used for dental cavity pain, and the juice of fresh bulbous buttercup has been applied to nostrils to induce sneezing for the relief of headache. For pain and rheumatism, freshly ground upper parts of the plant rubbed directly on the area of pain to form blisters have been used. There is no proven safe or effective dose for bulbous buttercup. However, 1 tablespoon of cooled infusion (2 drachms of fresh root cut into small pieces infused in 1 pint of hot water) has been used for obstinate sore mouth. The dose for this herbal supplement may be different for every patient. The dose that you take depends on your age, health, and several other conditions. Herbal supplements are not always safe. Please discuss with your herbalist or doctor for your appropriate dosage. Toxins of the plant can be destroyed by heat or by drying. When eaten fresh, Bulbous Buttercup and other members of the Buttercup family are somewhat poisonous to livestock, causing a souring or discoloration in the milk, but not death. Corms were sometimes dried, cooked and eaten as a starch supplement during times of famine in France. European beggars rub it onto their skin to raise blisters and evoke sympathy from passersby. Do not take during pregnancy and breast feeding. 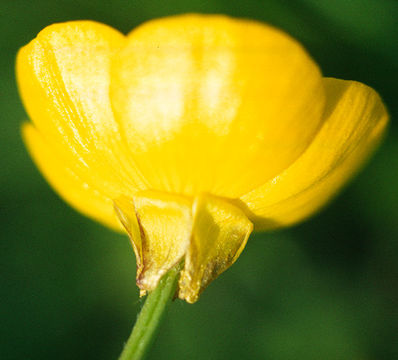 When rubbed on the skin, bulbous buttercup causes blistering, swelling, and topical ulcers, which were said to alleviate pain topically as well as hypodermically. All parts of the plants were used to induce vomiting and diarrhea upon ingestion. The plant has a strongly acrid juice that can cause blistering to the skin. Bulbous buttercup may cause ventricular fibrillation. 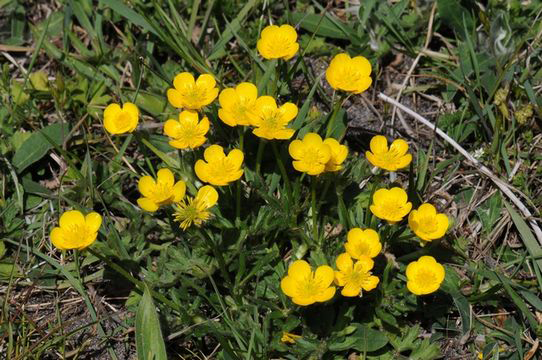 Patients taking anti-arrhythmic medications should use bulbous buttercup with caution. 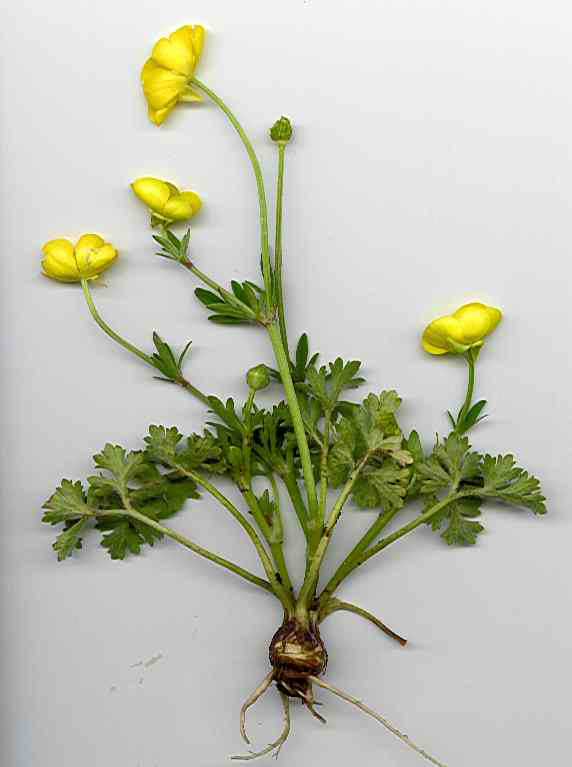 Bulbous buttercup may be hepatotoxic (liver damaging). Patients taking medications that may also be liver damaging should consult with a qualified healthcare professional, including a pharmacist. 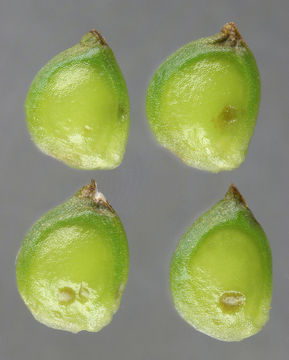 Native Northern parts of Europe and in the northeastern U.S.
Leaves are a famine food used when all else fails. 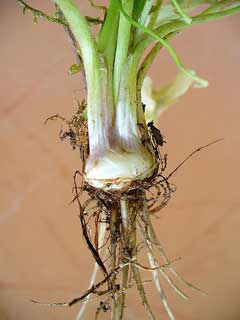 When boiled, the roots are said to become so mild as to be eatable. Ranunculus dissectus Rouy & Fouc. Ranunculus bulbosus var. valdepubens (Jord.) Briq. Ranunculus speciosus Hort. ex E.Vilm.